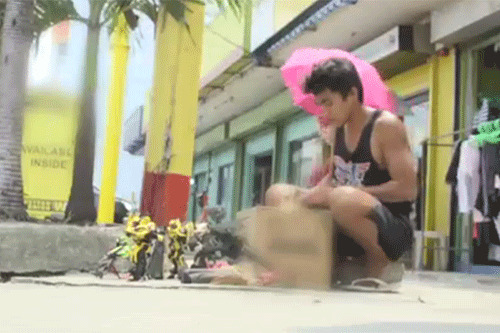 Hollywood star Mark Ruffalo showered praises on Pinoy artist-vendor Elmer Padilla, who recently made headlines with his talent in crafting action figures from recycled tsinelas, or flip-flops. Ruffalo, who is better known as The Hulk in The Avengers, posted on Twitter a picture of himself holding a Hulk doll crafted by Elmer. Elmer hails from Catbalogon City, Samar, but currently resides in Imus, Cavite. It is not clear how Elmer's creation found its way to Mark, but the New York-based Hollywood star was clearly amazed by the action figure made from scrap materials. Mark described Elmer's action figure as "inventively creative, sustainable, and just pure awesome!" The 49-year-old Hollywood actor is also known for his movies Begin Again, Now You See Me, and Just Like Heaven, among many others. WHO IS ELMER PADILLA? According to FHM Philippines's September 29 report, Elmer is a vendor who was first spotted at a public market in Imus, Cavite, where he crafts action figures inspired by his favorite action movies. Some of his creations include miniature replicas of Bumblebee from the Transformers Hollywood movie, as well as Neo, the lead character from the action film, The Matrix. Elmer also appeared in the September 24 episode of Kapuso Mo, Jessica Soho, a weekly public affairs program in GMA Network. The 30-year-old artist-vendor said that his miniature toy replicas are sold for P500 to P600, while his original works are sold for P100 to 200. He added, "Kahit singkwenta isang pirasong character lang. Mabigyan ko lang ang pangangailan ang pamilya ko. "Hindi na siya nababasag, nakakatulong pa ako sa kalikasan kasi [gawa lang ito sa] mga retasong tsinelas."